They say that the way to a man’s heart is through his stomach. Well, I believe the same can hold true for any woman with a sweet tooth. This morning I was flipping through channels and stumbled upon the Barefoot Contessa – my absolute favorite chef on the Food Network. The episode’s focus was on Ina’s favorite chocolate recipes; chocolate cake, chocolate fondue, chocolate truffles, etc. 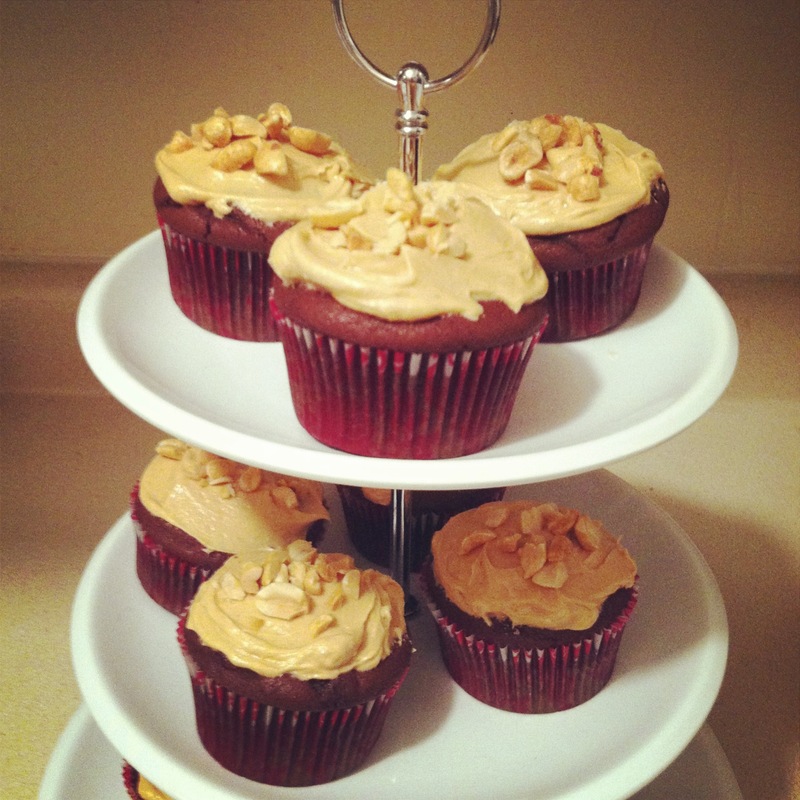 One of the recipes that she featured was for chocolate cupcakes with peanut butter frosting. They looked absolutely scrumptious. So, naturally, being the little baker that I am, I decided to replicate the recipe. Fortunately, my roommate and I were hosting a small dinner party tonight so we were able to share the wealth with our closest friends. 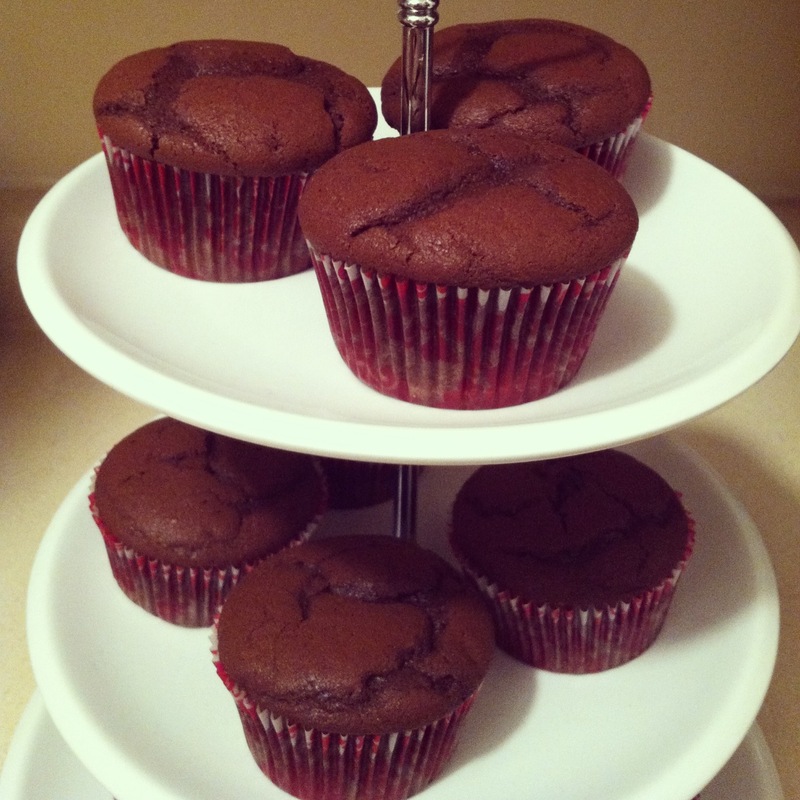 The recipe is very simple and the cupcakes were a huge hit. They are fluffy, moist and decadent and look great on a three tiered cake stand. With a hand mixer or in the bowl of an electric mixer, cream the butter and 2 sugars on high speed until light and fluffy. Lower the speed of the mixer to medium and add the eggs one at a time, then add the vanilla and mix well. In a separate bowl, whisk together the buttermilk, sour cream, and coffee. In another bowl, sift together the flour, cocoa, baking soda, and salt. On low speed, add the buttermilk mixture and the flour mixture alternately in thirds to the mixer bowl, beginning with the buttermilk mixture and ending with the flour mixture. Mix until blended. Divide the batter among the cupcake pans. Bake for 20 to 25 minutes, until a toothpick comes out clean. Cool for 10 minutes, remove from the pans, and allow to cool completely before frosting. With a hand mixer or in the bowl of an electric mixer, mix the confectioners’ sugar, peanut butter, butter, vanilla, and salt. Mix on medium-low speed until creamy.